Godflesh is the brain-child of Justin Karl Broadrick (ne JK Broadrick – guitar, vocals, programming) and Ben George Christian Green (ne GC Green – bass). In 1982 Green formed, along with Paul Neville, Fall of Because, a primitive industrial-metal band which actually wrote some of the basic forms of songs which would become early Godflesh numbers. The two asked Broadrick (who was playing a minor role in Napalm Death) to play drums and contribute vocals to the project. Fall of Because ended in 1986/7. Broadrick was no longer playing in Napalm Death at that time, but was in a noise rock band called Head of David. After departing from that project, he reached out to Green to reform FoB in 1988. 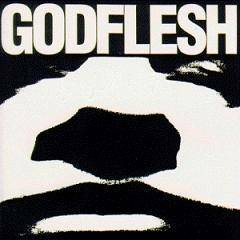 That reformation would lead to the creation of Godflesh, in which Broadrick took over guitars, incorporated the use of a drum machine, and became the main creative driving force. Paul Neville would remain a close contributor to Godflesh in the early years. The band’s fusion of doom/stoner metal (Black Sabbath, St. Vitus, Candlemass), industrial/power electronics (Throbbing Gristle, Whitehouse, Lou Reed’s Metal Machine Music), and the ambient cinematic works of people like Brian Eno or John Cage, has been often lauded as a significant influence on extreme/heavy music in it’s wake. The band’s first release is actually one of their most intricate and impressive from virtually every standpoint. In my opinion, this is the best place for anyone to start when getting into Godflesh. Later albums would veer into isolated territories of style, but this one remains an entire united nation’s worth of sound – everything coalesces together into one monolithic entity that defines the band. It also is their closest to sounding like a normal heavy metal band. The drum machine, while certainly sounding artificial, is treated, for the most part, like a digital drummer and the electronic noise is oftentimes almost indistinguishable from Justin’s guitar work (although there are plenty of chunky riffs to satiate those who crave that organic, Sabbath-y sludge). The opening hyper-speed drum hits into sloth-paced riffing is immediately unforgettable and the ensuing track, Avalanche Master Song, ranks as one of the band’s best and most beloved by fans. Here, the band sounds like the aforementioned Black Sabbath practicing in the factory Tony Iommi lost part of a finger in. Other standout tracks are Weak Flesh, one of the band’s more aggressive/punker sounding numbers, and Ice Nerveshatter whose title is equally brilliant and obtuse and offers a crescendo rarely equaled in the band’s catalog. The Earache reissue features two bonus tracks which are remixes of the songs Wound (Tiny Tears EP) and Streetcleaner. Neither is anything particularly essential or moving. Like many of Justin’s remixes, I find them interesting and enjoyable to listen to here or there, but nothing of any real consequence. More like exercises in experimentation; not to be ingested for sustenance, but amuse bouche for the artist within us all, of however small ambition. The cover is an image taken from the beginning of the 1966 science-fiction film Seconds, directed by John Frankenheimer and starring Rock Hudson. Oddly, the same images were used in the title sequence of the 1991 remake of Cape Fear by Martin Scorcese (which the band would later wind up seeing, in the theater, together). While often cited as being “lo-fi” or having very basic/poor production qualities, I find the sound quality and overall recording/mixing to be basically perfect. Many later Godflesh releases have annoying mixing issues, for me at least, but here everything seems to be right there for you to hear cleanly, but still sounding like rusty metal being torn apart in a junkyard. Perfect. This entry was posted on Saturday, June 22nd, 2013 at 3:12 pm and is filed under Reviews, Uncategorized. You can follow any responses to this entry through the RSS 2.0 feed. Both comments and pings are currently closed.